We found the cottage to be perfectly located for our needs. We?d definitely return! Our highlight was being able to just wander down to the beach, across the lane to the pub or just a few doors down from the local shop. The cottage itself was spacious and spotlessly clean. Perfect for our needs. The parking space was tricky to get into owing to a resident parking awkwardly off the lane however. We?d definitely recommend The Plume for food and drinks but book to avoid disappointment. The kids loved pool and table tennis at The Harbour Club of an evening. Porthcurnick beach is a 5 minute walk away and allows dogs. The hidden hut is a must. The only downsides to the cottage were a lack of glassware, no shaving point and the bed was rather uncomfortable really. Perhaps a new mattress would be a good investment. The location of the property was perfect! So close to the sea and all the village has to offer. 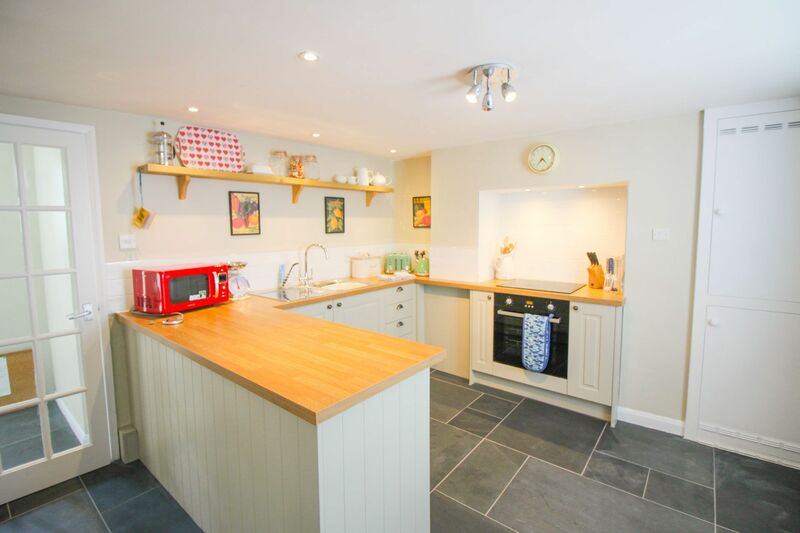 Lovely kitchen really well equipped with everything you may need. Good bathroom and great to have a parking space. Such a shame that the bed in the double bedroom is so uncomfortable that you don?t look forward to a good night sleep after a great day out. The outside could be a lovely place to eat or have an evening drink but it is really dated and is in need of a good tidy and a bit of work. There was also no guest book or contact details if we needed anything. Shorelines is a very well organised property with dishwasher and separate laundry/freezer area. It has a good shower and well equipped kitchen (with the surprising omission of a microwave). 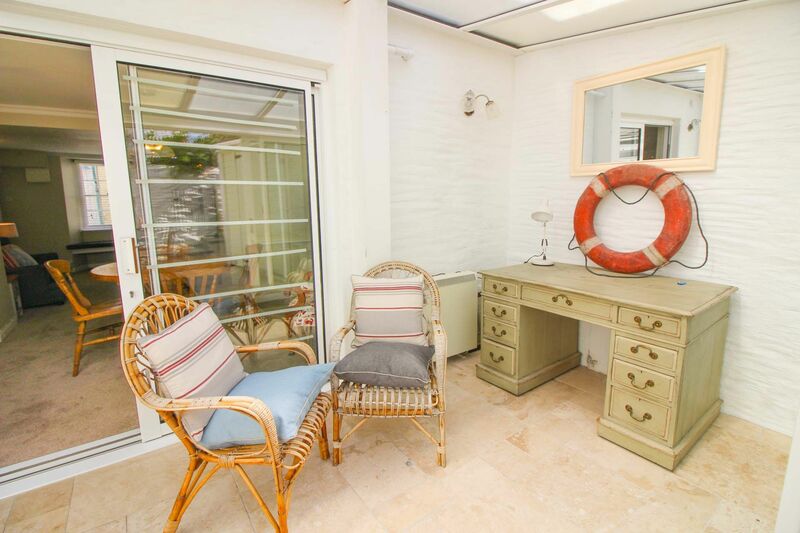 The property is roomy although more could be made of the conservatory area where a desk and low table took up too much space. The double bed, though furnished with delightful bedding was rather uncomfortable. Late night revellers from the Harbour Club and the pub opposite we?re very noisy on a couple of nights. On the other hand the location is perfect for children to run down to the town beach, extremely close to the very well stocked shops, and Tatums coffee bar and the Taverna for pizzas. There is also car parking - very difficult in Portscatho during the season. We?d definitely stay there again. Loved Portscatho, the cafe by the sea is great. The cottage was lovely, the outside area needs a bit of a freshen up but apart from that everything is in great condition. We loved Shorelines. 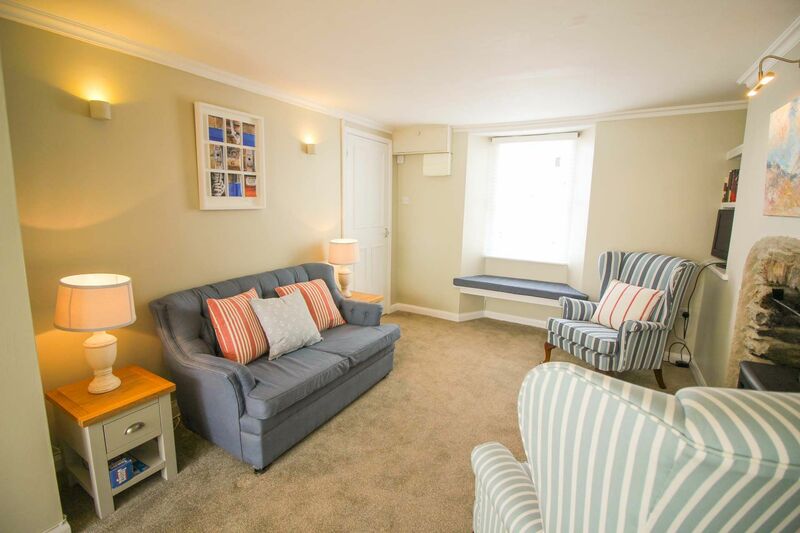 Amazing location a stone's throw from the beach, directly opposite a nice pub, great coffee/pastries less than a minute's walk (Tatams) and walking distance to other great beaches. We will be back. Fantastic holiday in Cornwall, lovely cottage, great local pub and lovely village We would definitely stay there again . It's a wonderful cottage in a great location. There's just a bit of tattiness that could do with sorting out - particularly windows and blinds, and the backyard could do with a spruce. But it's really a great cottage, a lot more spacious than you would expect. There were 2 evenings with slightly noisy late night revellers at the pub opposite - if the windows/glazing were sorted at the cottage, then the noise disturbance would have been less (especially the twin bedroom where the window actually has a gap at the top). Had a fantastic 4 nights at this cottage. The location is absolutely perfect. Beach, coffee place, pub, cafe and local stores all within 15 seconds walk!! The cottage was exceptionally clean when we arrived and had everything you'd need, daughters were especially impressed with the fast broadband! 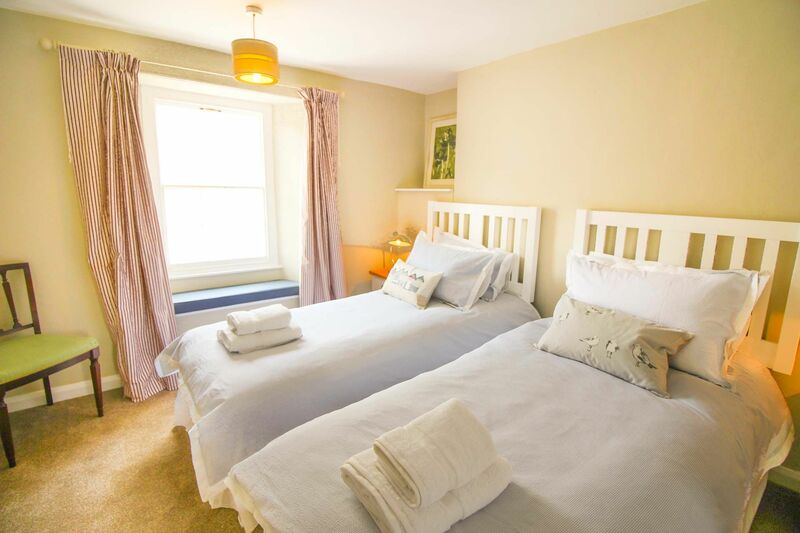 Portscatho is the perfect base for exploring the Roseland so if you're a family of four stay in Shorelines. I know previous reviews mentioned the parking space. Yes it is tight, but wasn't a problem for our Astra. Look in the shed/ store in the courtyard- there's a larger fridge/ freezer in there and a washing machine and tumble dryer. We didn't realise they were there until 5 minutes before we left! Lovely cottage, lovely location. Great base. Cosy cottage all mod cons. Lovely old pub 10 steps away serving good food. A few more steps in opposite direction slipway directly onto beach. Amazing walks can be found along the coastal path. A wonderful little cottage in a perfect location. Shorelines offer everything you could possibly need for a holiday in the way of comfort and convenience. It's located on the SW coastal path, for those who want to park their car and not use it for the duration and opposite a very friendly pub! We will certainly be returning. We've just returned from a fabulous holiday in portscatho staying at shorelines. When we arrived at the cottage everything was clean and the decor was nice with a big modern kitchen, clean appliances, plenty of crockery, cook wear, cutlery, etc. Cornwall cottages had left us some milk, biscuits and toilet rolls which was nice. 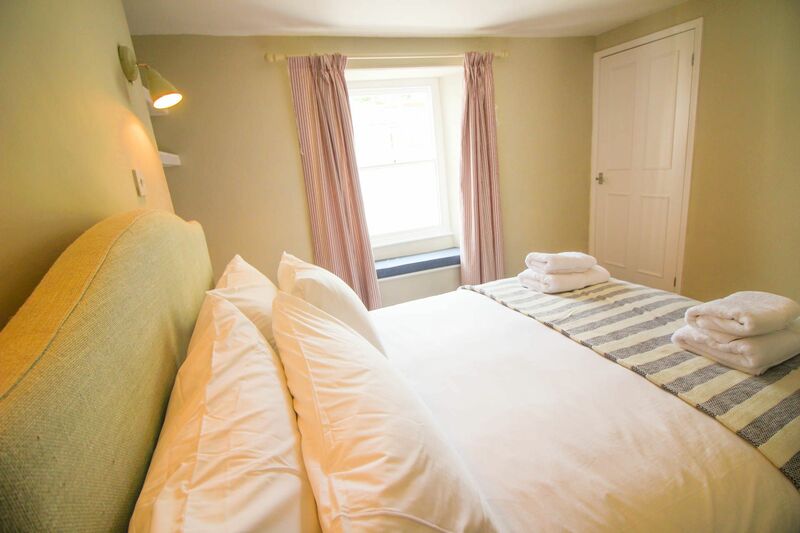 Bathroom and bedrooms were very clean, with crisp white bed linen. The negative however which has been mentioned in previous reviews, was the bed, we felt we were sleeping on the side of a hill and the first few nights were spent trying not to roll out the bed! The village is small and peaceful with a couple of shops. We did have a tesco shop delivered but also made use of the local shop which sold everything! A few art galleries and a gift shop. Had a few pints in the plume of feathers, a bustling busy type of pub which was very nice and friendly and also the harbour club which was quiet, staff very friendly, with comfy chairs and a lovely terrace looking out to sea, both dog friendly. We also visited the beach, a short walk along the coast (dog friendly) and ate at the hidden hut which was scrumptious. Also visited with our dogs, the gardens of heligan (fantastic), st mawes (ate in the st mawes) hotel, st Anthony lighthouse and coastal walks, the church at st just on the rose land with sub-tropical gardens, Truro shops via the King Harry ferry. Overall we had a fab holiday visiting a part of Cornwall we had never been to before and shorelines was a lovely cottage in an excellent position to base ourselves. A memorable holiday! Thank you Shorelines. Superb stay, everything perfect. If we had to be picky it would be a larger sofa and a larger t.v. would be good ! We had a wonderful few days staying at Shorelines. The house has been finished to a very high standard and was extremely comfortable. The position in the centre of the village and a few minutes walk to the beach is perfect. Many thanks. 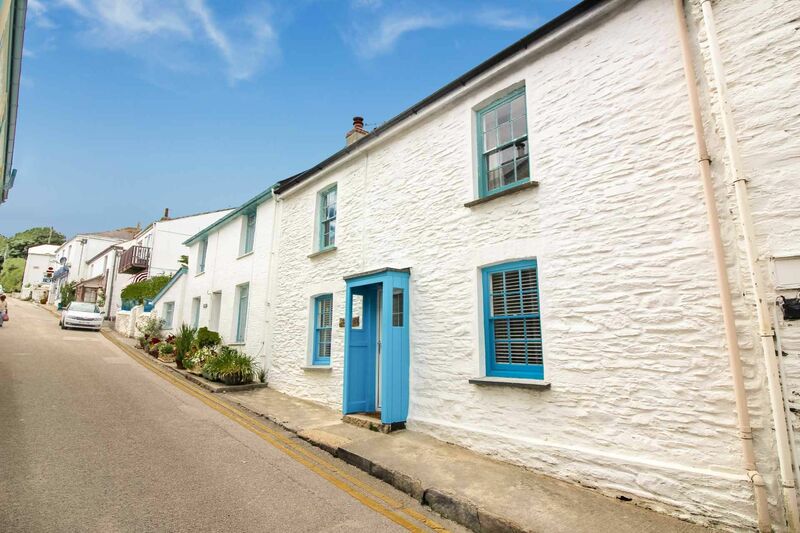 Recently refurbished cottage in excellent condition just up from the harbour. About 10 metres from The plume of Feathers pub, which does great food and is a very friendly local. Really lneed very cottage. Left after 3 days wanting to stay longer. Lovely location short walk down to beach, friendly village pub just opposite. The cotttage was cosey, clean nicely decorated, with everything we wanted. Only minor point was it would be nice if some firewood had been left for the log burner. But overall great let - highly recommended. great place to stay, local cafe and shops excellent and nearby beaches great for our dog. Cottage is excellent, the allocated parking space is tight as mentioned on other reviews but my Nissan Qashqai fitted in fine. Only minor complaints were the lack of any logs to use in the log burner when we arrived. We got there quite late and the shops locallly were shut so were unable to buy any and could not use it on the first night. Also we were there at Xmas so would have been nice for the house to have been decorated with a tree etc...it does not need to resemble Oxford Street lights but just a little tree with a simple row of lights would have been nice. 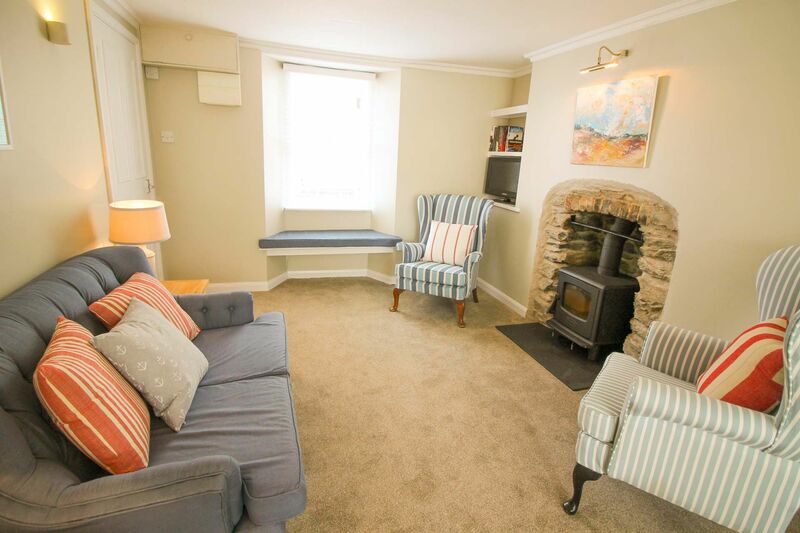 This is a very nice cottage set in the middle of the village a few metres from the sea. 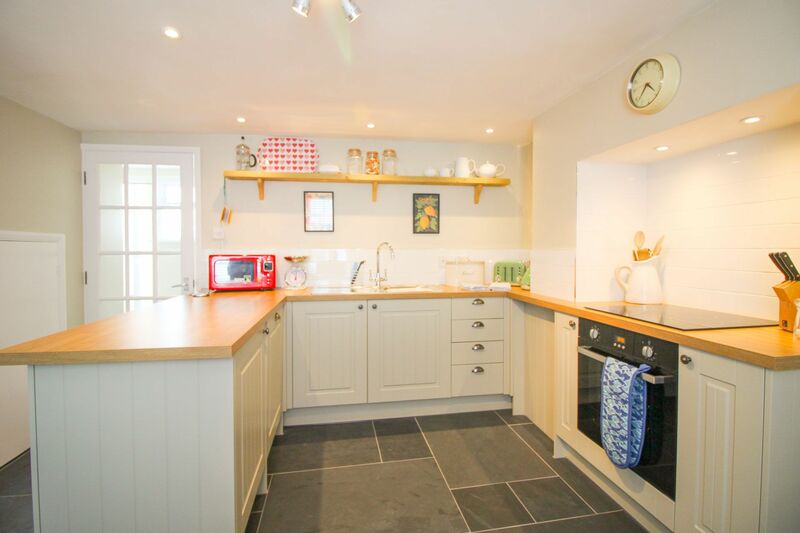 The cottage is kept in a good condition with all the facilities you would need. However, the parking is very tight at the rear of the property so we parked in a nearby road which was fine in December but probably difficult in summer. There is a shop and butcher a few doors away catering for most needs. We did not use the pub opposite which seemed to be mainly for drinking as the menu was quite limited. Excellent fish and chip van which visits the village on Friday evenings. Overall, a very enjoyable stay in a comfortable cottage. A comfier bed and sofa stopped this property from being excellent all round. To improve customer service would have been good to have stocked up on toilet roll, washing up liquid and logs for fire. Had a great time though. We have stayed here before and loved it. It as sold and completely renovated to a fabulous standard. New kitchen, bathroom etc. We love it even more now. 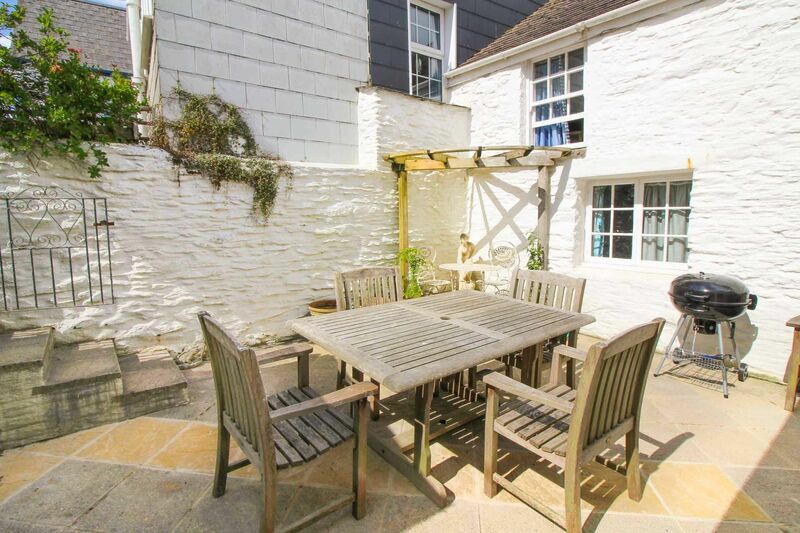 Superb for Couples or a small family right in the middle of Porthscatho. Can't wait to go back. Beautifully equipped, decorated and located, with the sea just metres from the door, plus a welcoming pub with good food opposite and shop steps away, this cottage is ideal. The coastal walks are stunning and Portscatho is ideally situated to visit all of Cornwall. Thumbs up! We were delighted when we arrived at Shorelines. It was very comfortable,tastefully decorated and spotless. On the worktop was a welcoming postcard with a contact number, There was a packet of shortbread biscuits, teabags and milk in the fridge...all greatfully accepted after our long journey down to cornwall. Parking of the car at the back of the property was very tight, but managed without too much difficulty. To be fair we were expecting this as it was stated in the cottage details that parking was tight. My car is a Vauxhall Meriva. 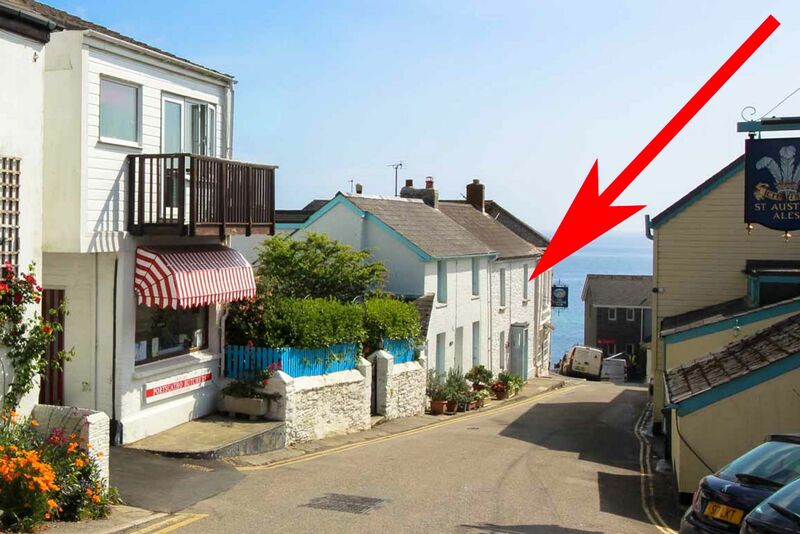 Portscatho is a lovely village, a good base to explore the many picturesque coves and creeks. Stayed at Shorelines in September and couldn't have wished for a better cottage. Location was perfect, right in the heart of the village. The cottage itself was beautiful, immaculate, spacious and charming. Everything we needed had been provided. Décor and furnishings were first class. Beds very comfortable, sofa a little on the small side, everything you needed and more in the kitchen. Loved the window seats where you could watch the world go by. Surprisingly quiet, little traffic and very well behaved seagulls. Due to weather not being particularly bright didn't get to sit in garden but very quaint and gated so the dog was secured. 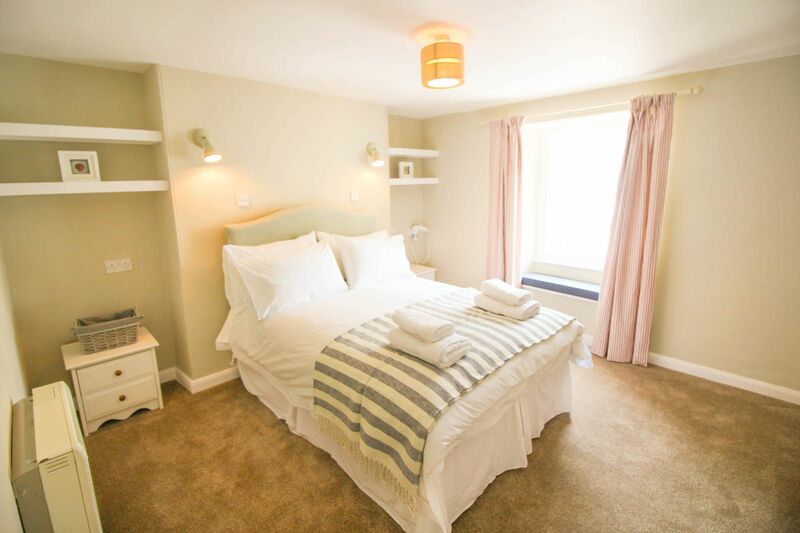 Close to pub, take away pizza, pastries and coffee shack and local shop. Parking space at back of cottage was challenging, suitable for small or average car. Plenty of parking elsewhere in the village. Locals very friendly. Very relaxing, enjoyable stay, would highly recommend. 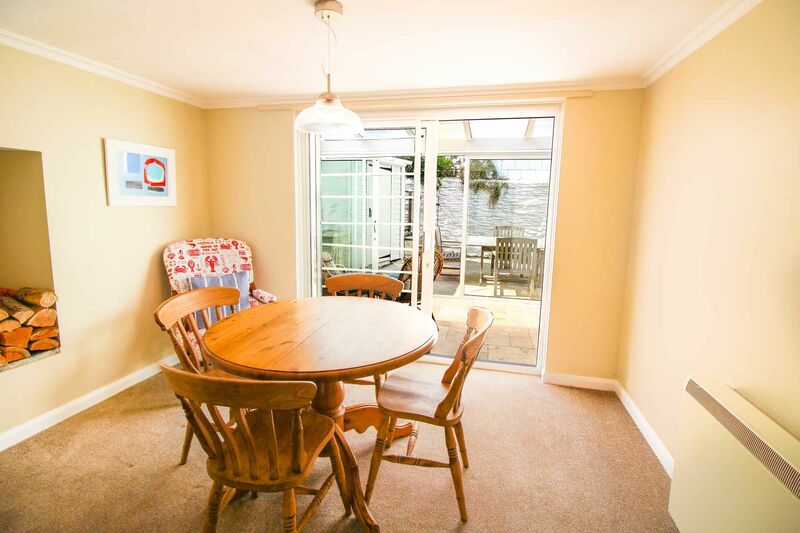 This is very spacious for a 2 bed holiday property. Tastefully decorated and well equipped and perfectly positioned in the village for the beach. We found the parking to be an excellent addition, we have stayed in a few properties in Portscatho before and liked that we didn't have to worry about our car for the week. We did feel the cottage would benefit from having curtains up at the rear french doors so that the lounge/dining area was completely private at night. The sofa was comfortable but a little on the small side for a couple to spend any length of time watching the TV. Our 2 year old loved the sunroom/conservatory and used it as a playroom/craft area as the table was a perfect height for her. Would definitely stay again and recommend to others. The cottage had everything you could need for a super holiday. The location is superb, 1 minute from a lovely beach, a great pub across the lane, a shop that stocks EVERYTHING! Coastal walks. Family of 4 + dog really enjoyed Shorelines. It was beautifully clean on arrival and contained everything we needed. The location is fabulous - a stones throw fro the harbour beach and the coastal paths. two small gripes: there could have been more crockery and cutlery - 4 of each meant we either had to put the dishwasher on after every meal, or wash up after every meal (which negates the purpose of providing a dishwasher). the lack of crockery/cutlery suprised us because all other kitchen stuff - pans, cooking utensils etc etc were in very rich supply! There was no storage space for dry food in the kitchen - all the available cupboard space was taken up with kitchen equipment. I'm not sure what the solution is here. In a self catering cottage you need somewhere to put your food! That said, neither of these things spoiled our holiday in any way. Yes we liked the property and the location.The settee is too small and the tv is minute.There is no excuse for these faults in 2016. We would come again but the parking space is awful for a big car.We thought the fridge freezer should have been in the kitchen (pantry cupboard) because bending down to use the integrated one is too difficult for "older" people (us). 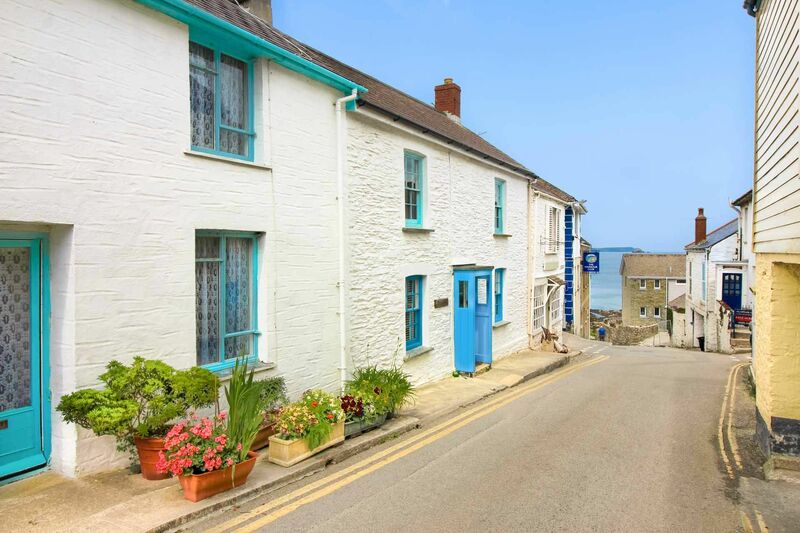 This pretty bijou cottage in the heart of the delightful harbour village of Portscatho, just off the village square, sits opposite the Plume of Feathers pub and about a minute's walk from Tatums Beach. 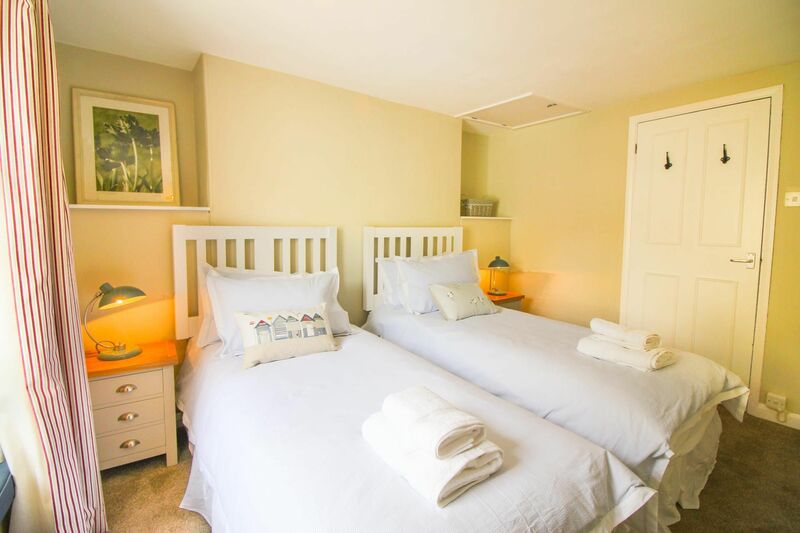 The coastal path passes just a few yards from your door, enticing you to wander along the enchanting coastline and enjoy the dramatic seascape of Gerrans Bay that has inspired generations of artists. 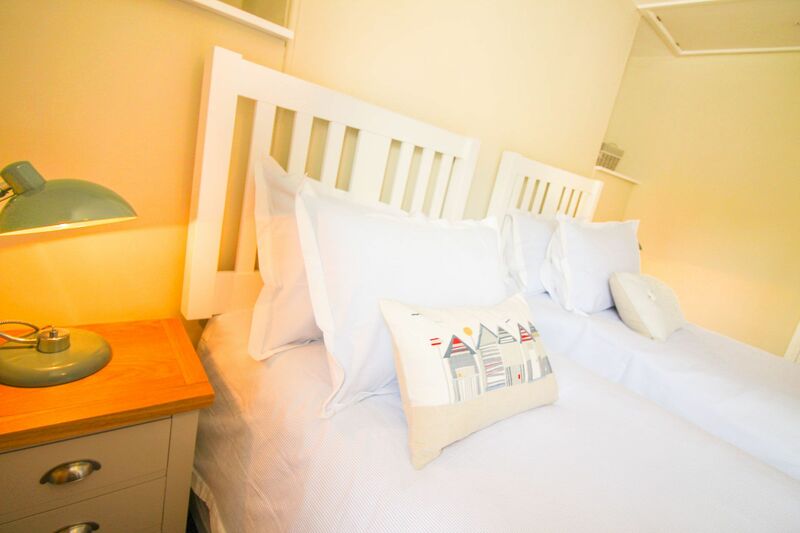 Rise early, sneak down to the harbour and experience one of Cornwall's beautiful sunrises or take a gentle lunchtime stroll along to enjoy a delicious alfresco meal overlooking Porthcurnick Beach at the famous Hidden Hut. Hire a kayak and explore the serenity of the upper reaches of the Percuil River on a rising tide. How about finishing the day with a Michelin star meal at nearby Driftwood Hotel? Once you stay in this tiny piece of paradise on the Roseland Peninsula, you will never want to leave! 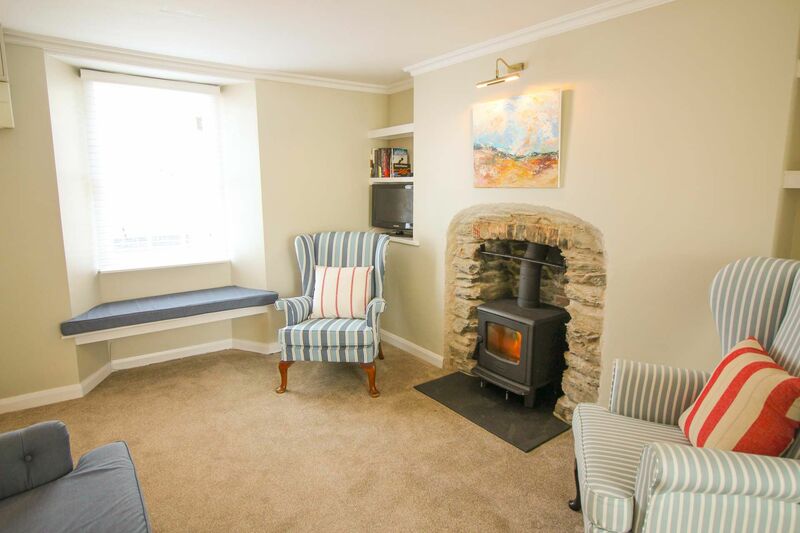 Shorelines is a proper Cornish cottage with thick stone walls, low ceilings and bags of character, sympathetically modernised to provide a stylish and comfortable retreat. 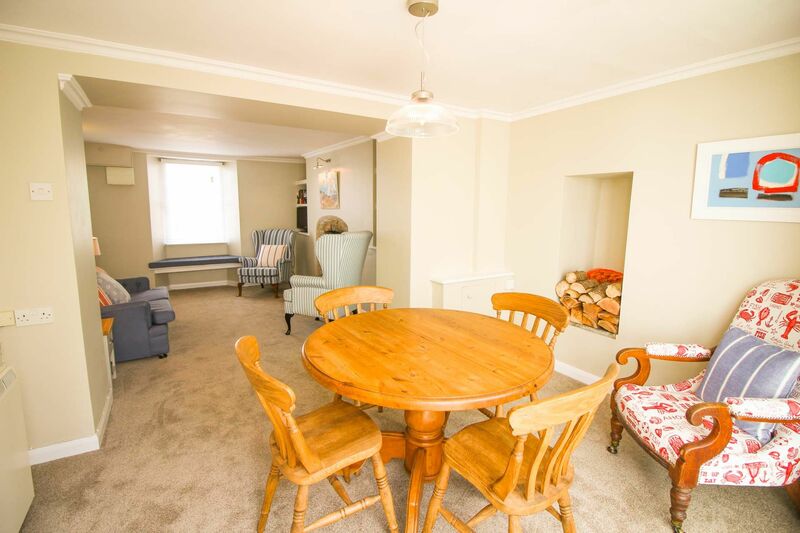 A modern kitchen, cosy sitting room with wood burning stove and a bright sun room opens onto an enclosed private rear patio, whilst upstairs there are two lovely bedrooms. The cottage also benefits from a private parking space to the rear. Ground Floor: Porch entrance through to fully fitted modern kitchen. Sitting room with wood burning stove and dining area with a sun room to the rear. First Floor: Master bedroom with 4'6" double bed and wardrobe. There is a hair dryer on a stand fitted to the wall. 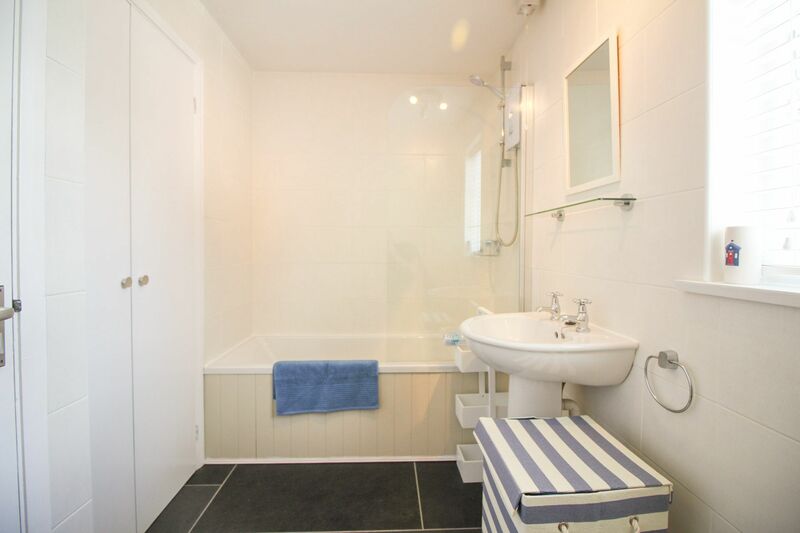 Twin room with storage and family bathroom with over bath shower. 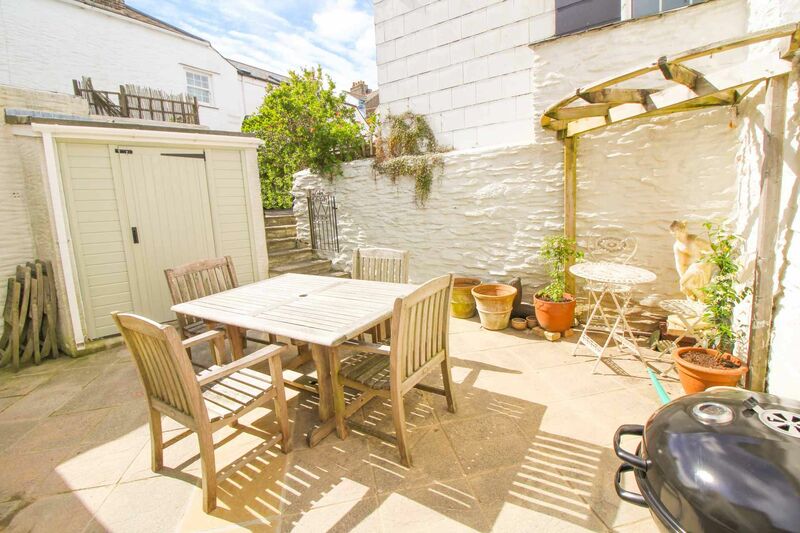 External: Enclosed rear private patio garden with small outbuilding that has been transformed into a utility room. There is a BBQ (charcoal not provided). Private car space to the rear. Please note the patio garden is overlooked by the next door property. Heating is via night storage heating and the open fireplace. 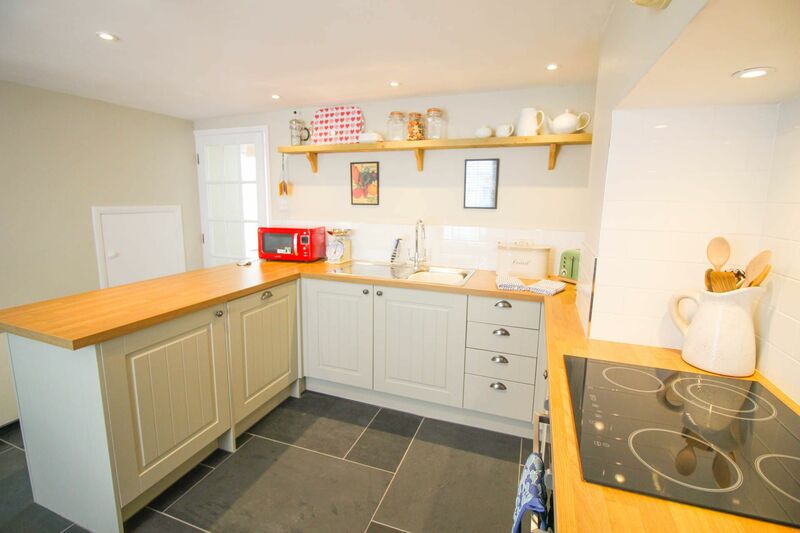 The kitchen has an electric oven and hob, a microwave, fridge with freezer compartment, toaster, kettle and dishwasher. 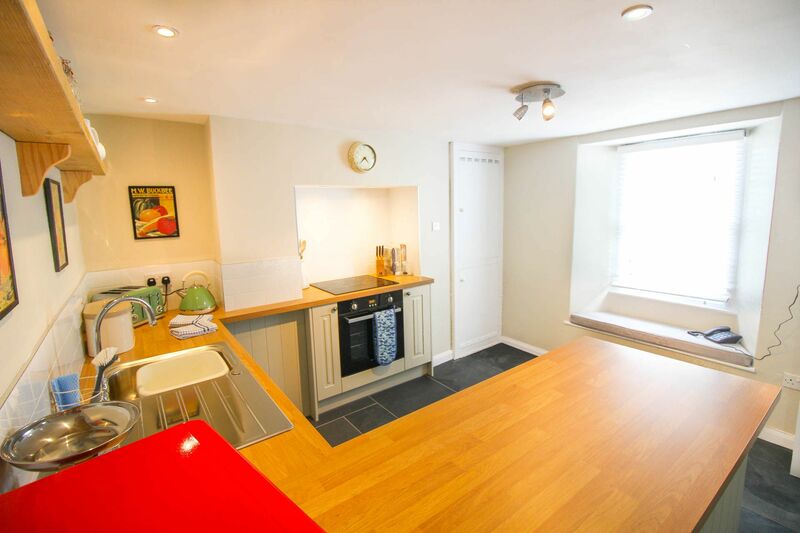 In the utility room there is a washing machine, tumble dryer and full sized fridge / freezer. The sitting room area has a TV & DVD player. There is Superfast WiFi available at the property. There is an iron & ironing board. Electricity, bed linen and towels are included. Regrettably no smoking is allowed. 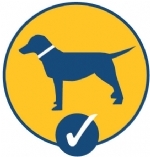 Up to 2 dogs are permitted at the additional charge of £25 per dog per week. There is a dedicated off the road car parking space at the rear of the property. Please be aware that access might be tight for some large makes of car. There is a cot and high chair available. 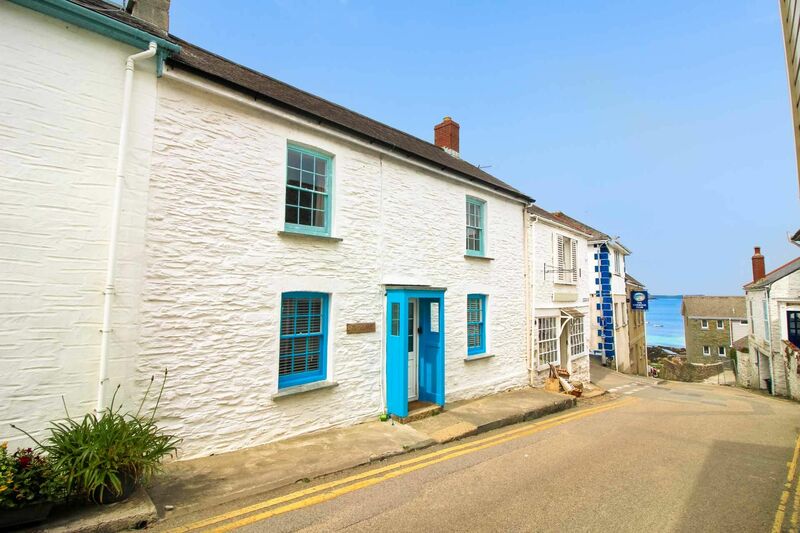 Portscatho lies on the eastern edge of Cornwall’s Roseland Peninsula, from where it boasts wide sweeping views of Gerrans Bay and excellent coastal paths to St Anthony’s Head. Porthcurnick, Towan and Porthbeor beaches are mere minutes away and the village of St Mawes is also only a short 10 minute drive. Portscatho and its neighbouring village of Gerrans are located on the eastern coast of the Roseland Peninsula, Cornwall, overlooking the dramatic Gerrans Bay. A truly peaceful waterside village, Portscatho is a lovely place for a holiday. There are miles of coastal and countryside footpaths to explore, particularly along past Towan beach and out to St Anthony's Head. Portscatho was once a busy fishing harbour, but now it has become a haven for artists due to the striking light which is particularly good in the morning sun. More than anything, Portscatho is a relaxing place. The beaches such as Porthcurnick, Towan and Porthbeor are simply idyllic and these are only minutes from the village. 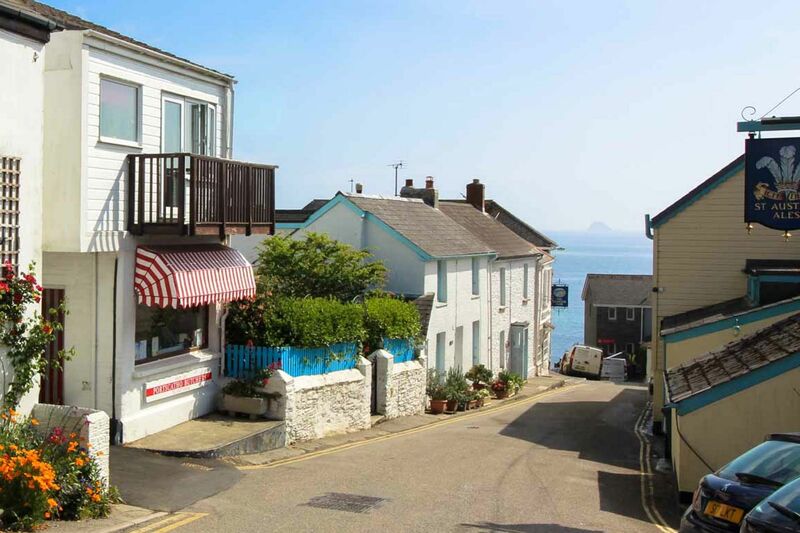 With a superb local butchers shop, 2 great little pubs and a well stocked local store, Portscatho and Gerrans are lovely places to spend a holiday. Ten minutes away you have the Round Houses at Veryan, or St Mawes Castle built by Henry the VIII. You can walk to St Anthony and take in the views from the Headland, right across the bay to the Manacle Rocks, back past the entrance to the Helford River, Maenporth, Falmouth and round to St Mawes. Gerrans Bay is a relatively sheltered bay and is often filled with ships sheltering from the Atlantic, or waiting to go into Falmouth Docks. You never know what you will see moored up. In 2009 a car transporter famously sat just off Pencabe Point for the summer.